10-point touch collaboration and dual pen touch simultaneously. 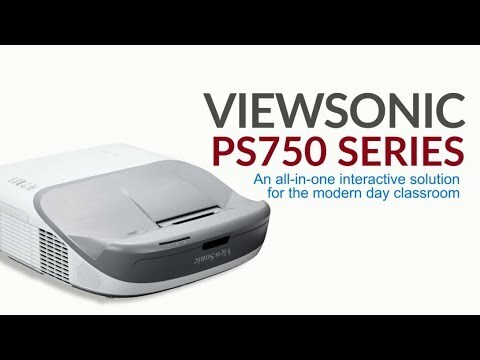 The ViewSonic PS750W projector is a total solution for school projection, complete with interactive modules, wall mount kit and digital white board software. With the ability to project 100” images from a distance of only 0.16m* from the projection surface, the projector is flexible enough to fit any classrooms installation and keeps the projection beam out of sight and eliminating image shadows for distraction-free classroom application. The all-in-one interactive solution encourages collaboration in the classroom and eliminating the installation problems. A customizable wall mount with quick installation and flexible adjustment featuring a 3-axis alignment system. The interactive module supports and recognizes finger touch, allowing users to work on projected images collaboratively. vBoard for Windows digital whiteboard software offers access to rich interactive teaching tools and allows teachers to take entire lessons from classroom to classroom with ease via a MyViewBoard.com account. Vertical projection is perfect for starting group discussions, making subjects more immersive, and allowing multiple students to collaboratively draw and write on the same flattop screen. Utilizing PS750W’s cleverly concealed PortAll™ compartment provides more flexibility when using wireless dongles and PC sticks and allows teachers to present their own customized lesson content. PS750W is the ultimate complete-package interactive projection solution for school projection and the perfect fit for making class more engaging than ever. PS750W can project vertically downward and is perfect for starting group discussions, making subjects more interesting, and allowing multiple students to draw and write on the same table screen. Equipped with ViewSonic’s proprietary SonicExpert® technology, PS750W’s dual 10W speakers are designed with a larger sound chamber and a more powerful amplifier to deliver immersive sound. PS750W is Creston, AMX and PJ Link certified and can be easily controlled and monitored remotely from a PC. IT personnel can manage up to 256 projectors at one time and control operations including scheduling through a LAN IP with an advanced, real-time alert system that sends status updates about power, lamp life, and unit location for simplified maintenance. Image size: 87" - 120"